The building, now extended and converted for use in worship, was originally a barn built c. 1690. Along with the creation of Silver End garden village in the 1920s the church was a part of the dream of the industrial philanthropist Francis Henry Crittall, in his words: ‘to make a pleasant village amid trees and fields with modern dwellings, ample gardens, playing fields and parks’ for the workers in his factories. F.H. 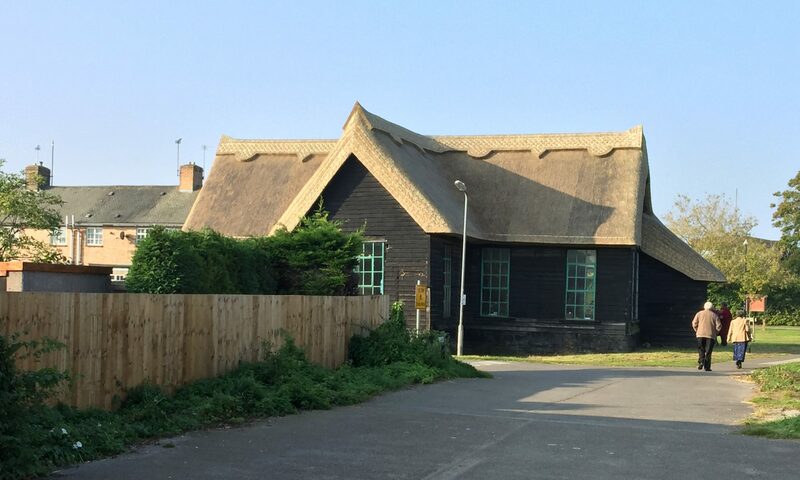 Crittall also supplied the thatched lychgate, which along with the green and the church itself form one of the most attractive features along the main road running through Silver End village. F.H. Crittall, an innovative window manufacturer supplied the distinctive metal-framed windows and doors in the Art Deco style, which are a main feature of this barn conversion. Mrs. F.H. Crittall donated the beautiful stained glass window depicting St. Francis of Assisi, in 1929. The thatch is long straw. The aluminium cross, manufactured by Crittalls in 1968, was placed in the original position of the doorway. That in turn was moved to the end of the building and formed the entrance to the porch. Inside, the natural finish of the light wood panelling is reflected in the materials of the furnishings and complimented with tapestries behind the altar along with hand-worked kneelers. The church was constructed to seat a congregation of one hundred on individual rush chapel chairs. The original ceiling is recorded as a deep blue. Though this was changed to a pale blue in the early 1980s, the gold and silver stars above the chancel have been faithfully restored. In the days of the midnight blue ceiling the tye beams which are now stripped back to a natural finish, were painted red. The original gold bands at either end have been retained. The wooden theme is reflected in the design of the rustic font which was a gift made to the church by Mr. Uriah Shelley, of Boucher’s Farm, Rivenhall. It is recorded as being fashioned from an oak tree planted near the then small hamlet of Silver End, in the twelfth century. That is the same century in which St. Francis of Assisi was born. The altar rails, reading desk and pulpit, all in a natural wood finish, were produced by workmen of the Crittall Manufacturing Company and designed by W.F. Crittall in conjunction with the main designer of the church, Mr. G.C. Holmes. The building was presented as a gift to the Church of England during a service of dedication to St. Francis, by the Crittall family, in 1930.